PONYTAIL hairstyles for Spring and Summer!! Hey everybody! I’ve really gotta stop with these roundups, they take FOREVAAA to film and put together!! They’re so fun though, they totally get my creative juices flowing. 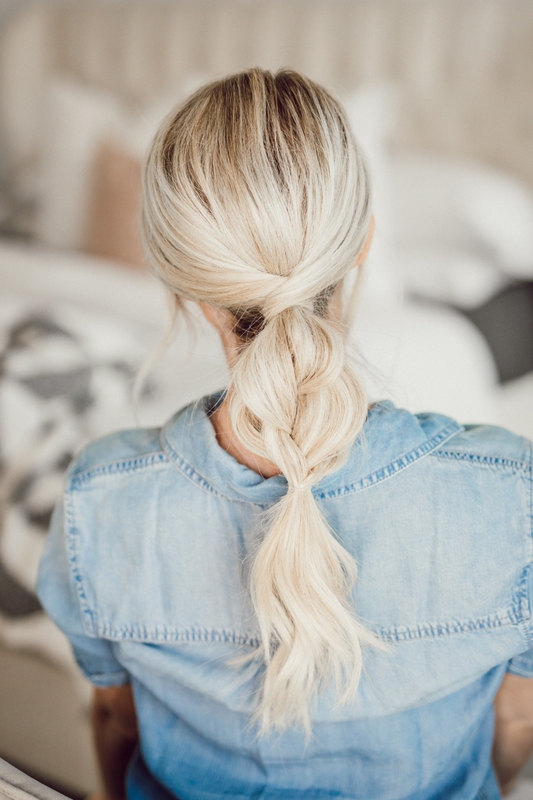 Today I’m sharing 7 ponytail hairstyles for Spring. Or Summer. These hairstyles aren’t biased towards one particular season or another haha but we’re in Spring so let’s just roll with that! During the day my hair is usually back and outta my face. And if you’re like me, you go for the same ole’ messy bun or ponytail day in and day out. 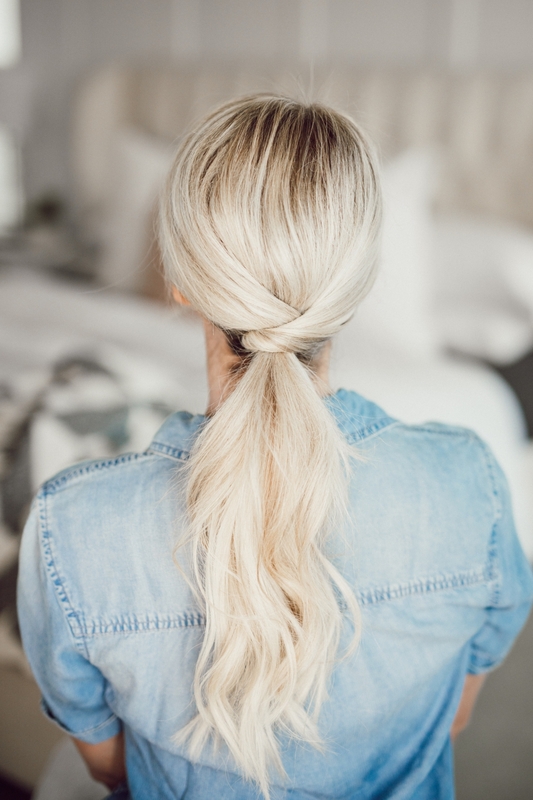 So I’ve rounded up my favorite ponytails to give you a little bit of inspo when you’re getting ready in the morning. You don’t need much time to complete any of these styles and if you’ve got curls leftover from the day before then you’re golden! I hope you enjoy the roundup! Let me know in the comments, what ponytail is your favorite one? You’re going to clip two sections out of the way and pull the rest of your hair into a low ponytail. Then gather one of the sections from the front, drape it over and around the elastic and use another clear elastic to hold it in place. 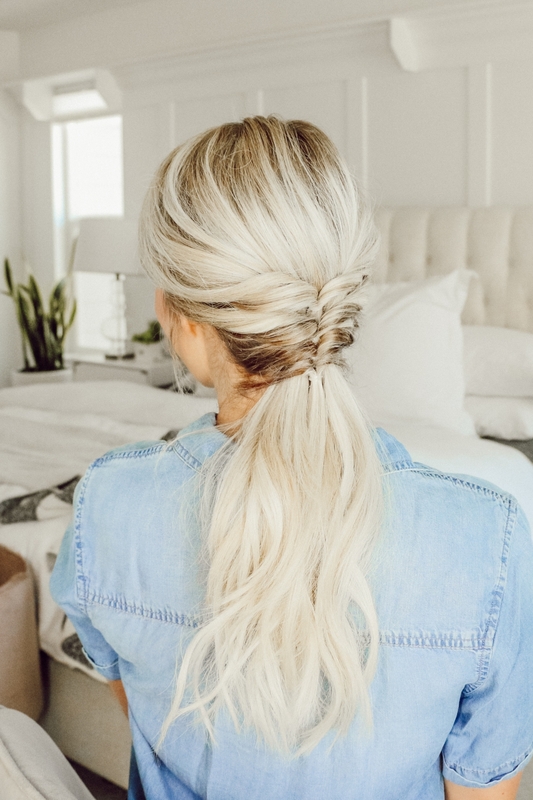 Then you’re going to do the same thing on the other side, drape the section of hair around the elastic and secure the tail on the bottom with another clear elastic! When you’re done, pinch the top layers of the ponytail with both hands and pull them apart. This is going to fan the hair out and lift the ponytail to make it a little perkier. 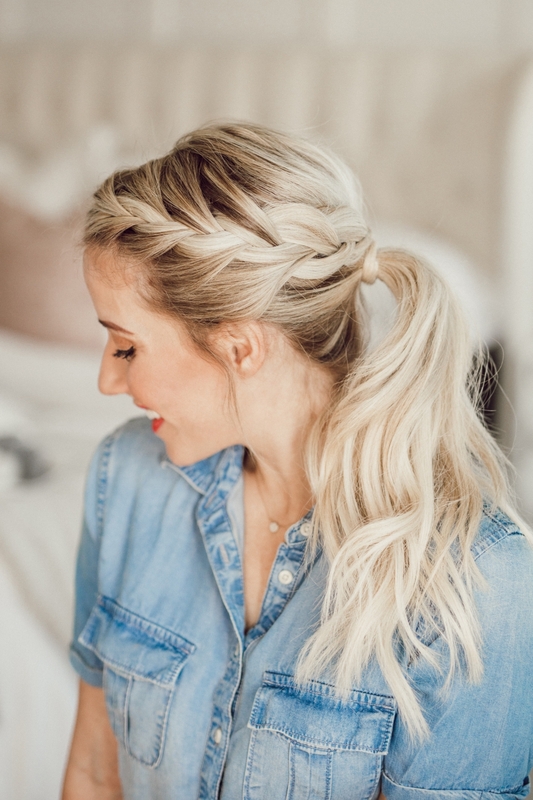 Take a large section of hair on the thicker side of your part, basically from the back of your part line down to your ear and do a regular three strand braid, all the way down. 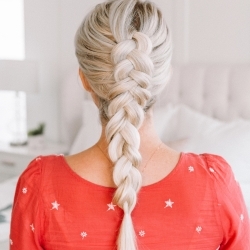 When you get to the end, hold the braid tight with one hand and then stretch the braid to make it look more full. I’m just pinching the outer piece of each section and gently pulling on it to loosen it up. Then drape the braid around the crown and pin it secure with a bobby pin. Repeat on the other side. 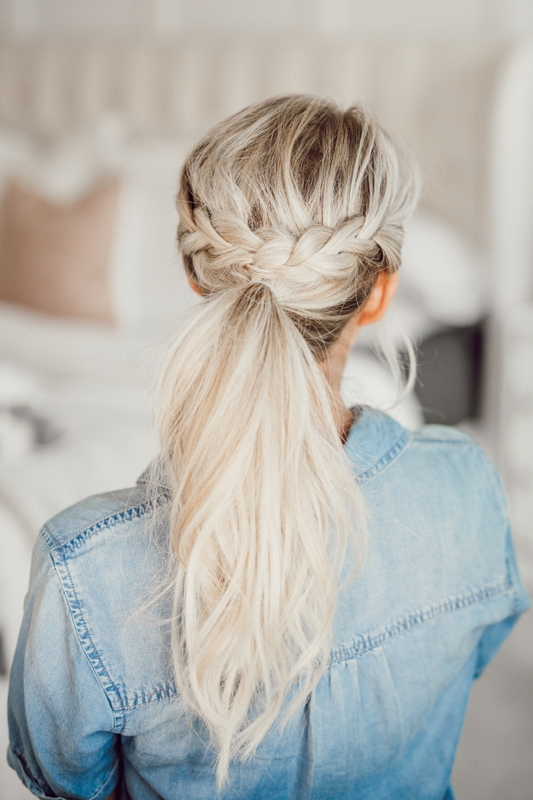 You can wear it like this, the crown braid is so pretty, or you can throw it up into a ponytail. Take two small sections from each side, combine them in the back with a clear elastic. Loosen the elastic just a little bit and then flip the tail up and through the hole. This is what I like to call a topsy tail! 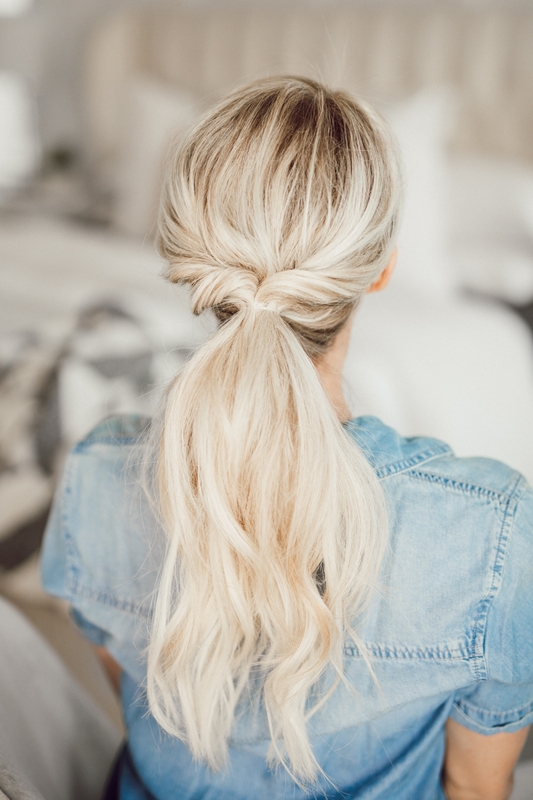 Cinch the tail so it’s tighter and go back in and loosen the twist – I like to hold the ponytail with one hand, and pinch the hair on top and gently pull it. You can see it plumps up the twist and makes it look a little more full. And then do a succession of topsy tails all the way down. I’m doing four, you want to make sure they’re all close together and that you get those baby hairs on your neck to finish off the style!!! Leave out two small sections in the front and pull the rest of your hair into a low ponytail. Split the ponytail into three equal sections and braid several stitches down. Then stretch the braid, pinch the sections and pull on them to make it look more full and tie it off with a clear elastic. Take the sections we left out earlier, twist one section over the elastic, and then while holding it with your non dominant hand, grab the other section and twist it over the first one. You’re going to combine them underneath the ponytail and secure with a clear elastic. 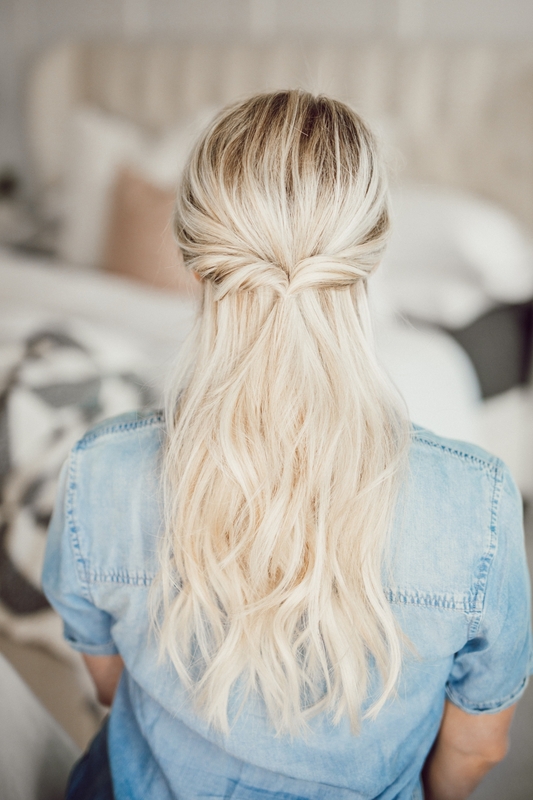 Then just roll the tails around your finger and pin them up underneath the ponytail with a bobby pin. Leave out a large section of hair in the front and pull the rest of the hair up into a ponytail. French braid this section back. The top strand is going to go OVER the middle strand and then the bottom strand is going to go OVER the bottom strand. That’s your first stitch. 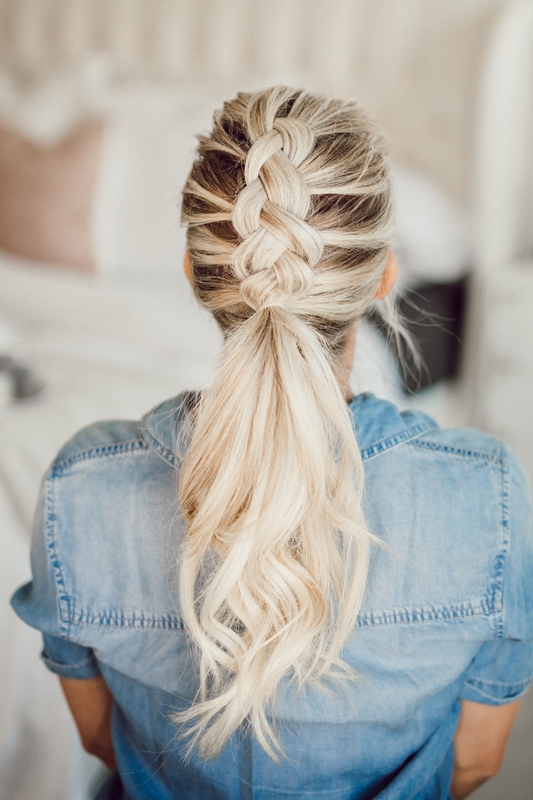 When you’re finished with your braid, stretch it out so it looks nice and full. Then wrap the braid around the ponytail and secure it by adding another clear elastic around the whole ponytail! Take two small sections from the front and twist them each back before securing with a clear elastic. Loosen the twists, pinch the top layers and it’ll make the twists big and full! Then pull the rest of the hair up into a ponytail. Make sure to pinch the top layers of the ponytail and lift up as you’re spreading them apart. 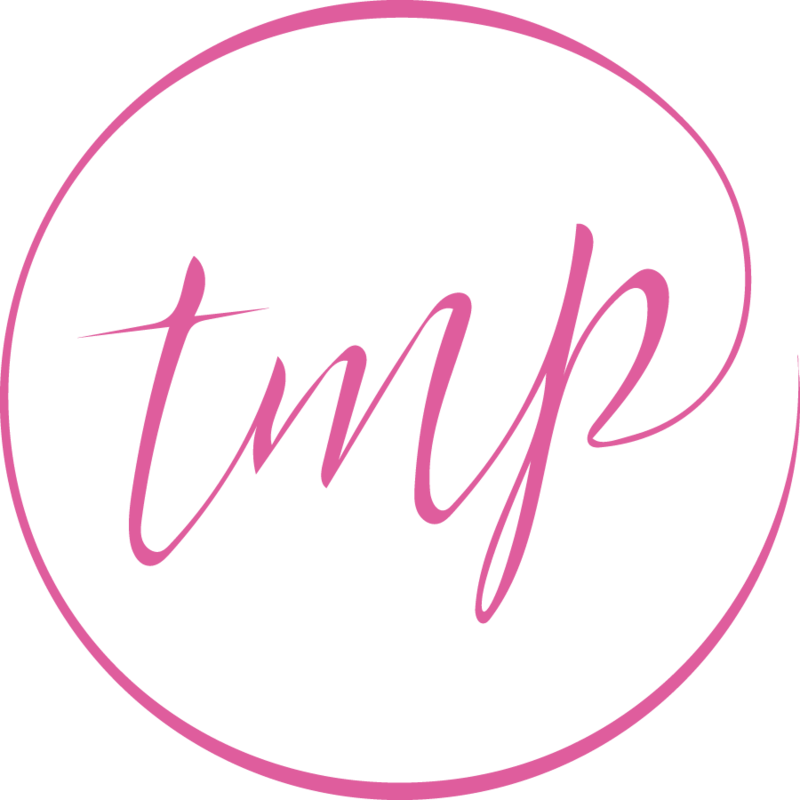 This is going to push the ponytail closer to the twists and give it a nice lift! Brush through a part if you have one, and gather a nice chunk of hair on top. 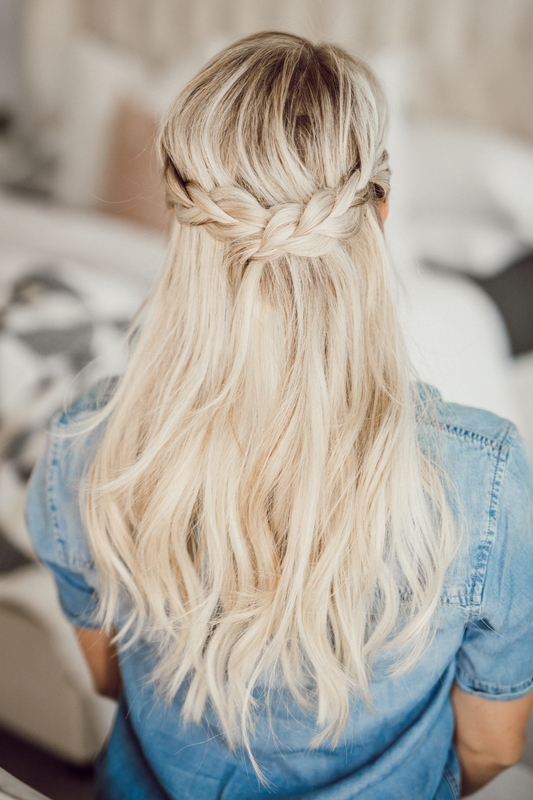 Split the hair into three sections and do a dutch braid. The outer strands go UNDER the middle section. 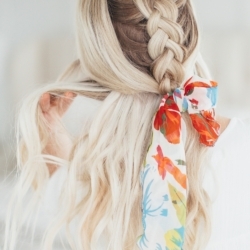 Tie it off with a clear elastic and stretch out the braid! And that’s it! I honestly had several more I wanted to add in but I didn’t want the video to be forever long! Let me know if you liked this round up and would love to see more! Also don’t forget, you can checkout my 10 easy medium length hairstyles video here and my 5 Spring hairstyles video here! 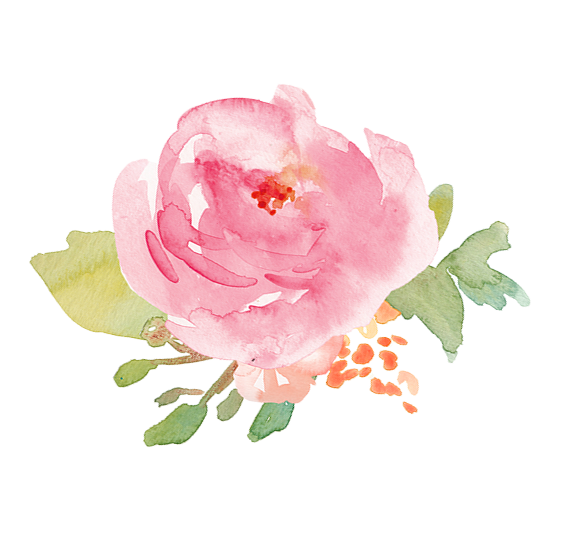 You can subscribe to my YouTube channel here if you haven’t and want to!